Welcome to the Oakville Handweavers and Spinners Guild Blog. We started in 1952 and since then we have taken part in many local community activities. Members of our Guild demonstrate spinning or weaving at historical sites throughout Oakville; we network with Guilds in surrounding areas by means of workshops and seminars; we participate with other local Guilds in textile exhibitions and provide individual and group instruction in weaving and spinning. 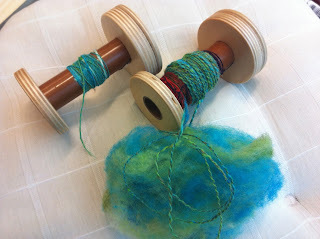 Chris shared her latest spinning works created with her dyed fleece, as well as her runner. she is playing around with her floor loom she has at home. Great job Chris! keep it up! Judith Hay sharing her collection of Peruvian sashes and bags from Peru. On behalf of the Oakville Handweavers and Spinners Guild, I would like to thank Pamela Hinton Langdon for donating her wonderful stash of assorted yarns and magazines. Pamela has been a member of the Mississauga Handweavers and Spinners Guild and was taught to weave by Ankaret Dean at Sheridan College. Tapestry and Spinning and Weaving Demonstrations. Show and and tryouts for weaving and spinning in the Fibre Arts Room.This activity is part of Culture Days at Queen Elizabeth Park Community and Cultural Centre presented by the Town of Oakville in partnership with The Oakville Arts Council and the facility cultural members. The event will provide interactive activities for every one of all ages. Activities featured: fibre arts, pottery, dance, musical performances, exhibits, and much more. South of QEW, between 3rd Line, and Bronte Rd. Last Saturday 29 the Oakville Handweavers and Spinners Guild demonstrated handspinning and weaving in our new location at the Queen Elizabeth Park. Pat Hood, one of our Members took her spinning wheel and shared her skills with the Oakville community. Kids where amazed on how this traditional technique still moves us to realise about what the fibres are made of. Stella Tang and Ixchel Suarez demonstrated weaving both on looms and in tapestry weaving techniques. Come join us in our new location at the Queen Elizabeth Park Community and Cultural Centre in Oakville. Queen Elizabeth Park Community and Cultural Centre (QEPCCC) is a unique multi-purpose recreation, arts and culture facility. Our Guild meets every Monday from 10:00 am until 1:00 pm. All levels are welcome. Spinning, floor loom weaving or tapestry weaving, together with interesting workshops, lectures and different projects. our Guild will be displaying some of our works and demonstrations in spinning and weaving. On Saturday, September 29 from 10 a.m. – 4 p.m. residents of all ages are invited to take part in hands-on and behind-the-scenes activities, performances and art exhibitions at Queen Elizabeth Park Community and Cultural Centre (QEPCCC) where artists will share their creative process, inspirations and techniques. A national cultural initiative launched in 2010, Culture Days is a collaborative volunteer movement to raise the awareness, accessibility, participation and engagement of Canadians in the arts and cultural life of their communities and has featured free, hands-on interactive activities from coast to coast. For more information visit the Culture Days website www.culturedays.ca. the card, and expand what you have already learned in the PART I back in April! extra dimension beyond just the warp and weft of traditional weaving. from her Grandmother and still uses that loom today. RSVP for a spot in this wonderful workshop/hands-on/September 10, 2012. 905 845 3357 , 289 242 8685 or reply to this e-mail at your convenience. Feel free to pass along this invite.